Every wargamer has a list of projects that are sitting around half-finished or which fall into the "I'd really love to do that one day" category. I have over a dozen. On the "half-finished" list (which in some cases means "barely started") are Alexander the Great, Julius Caesar and the Roman Civil Wars, English Civil War, American Civil War, Darkest Africa, Russian Civil War, the Punic Wars, Vikings, 1066, 1812 and several I've forgotten. As I write this, I'm also drooling over the new WAB "Age of Arthur" supplement and have concluded that this period must also go on the list. 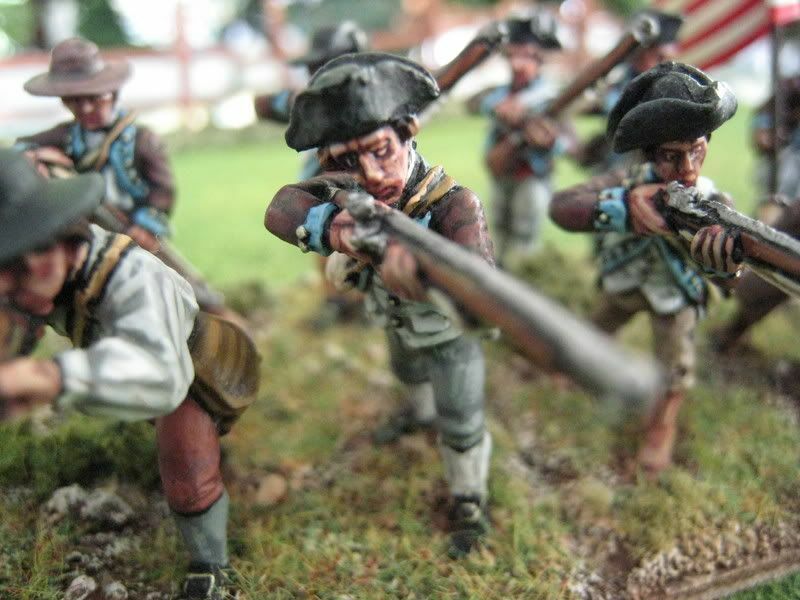 A long-term ambition is to work on an 1815 project using the marvellous figures produced by Perry Miniatures. 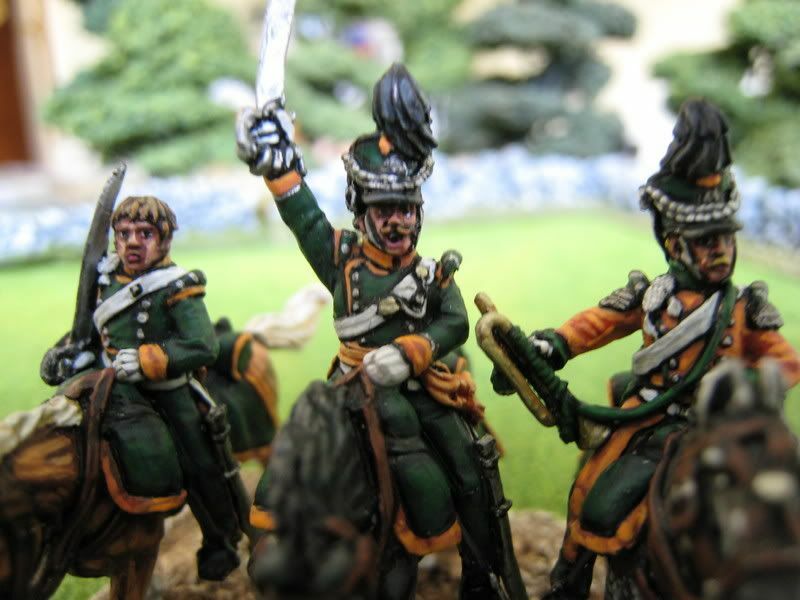 Loughton Strike Force's Waterloo game at Salute in April gives me an excuse to leave the AWI for a couple of months and paint up Dutch-Belgian cavalry and Napoleon & co. 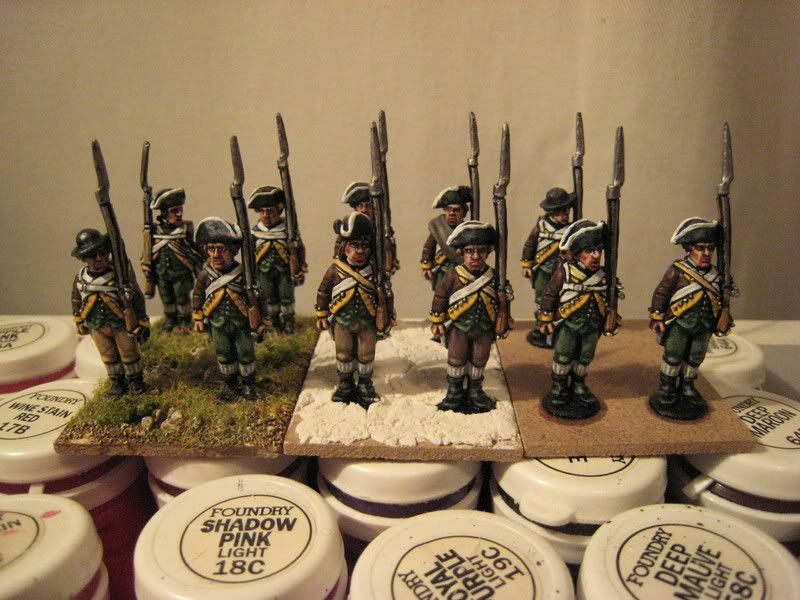 This year I also want to finish a French line infantry brigade using the Perry 1815 French figures. The picture shows the beginning, some "test" figures I painted last year but which I only based the other week. The painting and colour schemes I used need some refinement, but these are lovely sculpts and I'm looking forward to watching Alan Perry's range develop. "Additional" regiments were units raised regionally but not adopted by any particular state or assigned numbers on the regular Continental establishment. Sixteen such regiments were raised in January 1777, all named after their commanding officers. Thomas Hartley's Additional Regiment took its recruits from Pennsylvania, eastern Maryland and Delaware. It was assigned to Anthony Wayne's brigade and fought at Brandywine and Paoli before being posted to the Pennsylvania frontier in 1778 to guard against Iroquois incursions. In January 1779 the regiment was incorporated into a new 11th Pennsylvania Regiment, along with the remnants of Patton's Additional Regiment. A May 1777 edition of the Pennsylvania Gazette refers to a uniform of blue regimentals faced white. 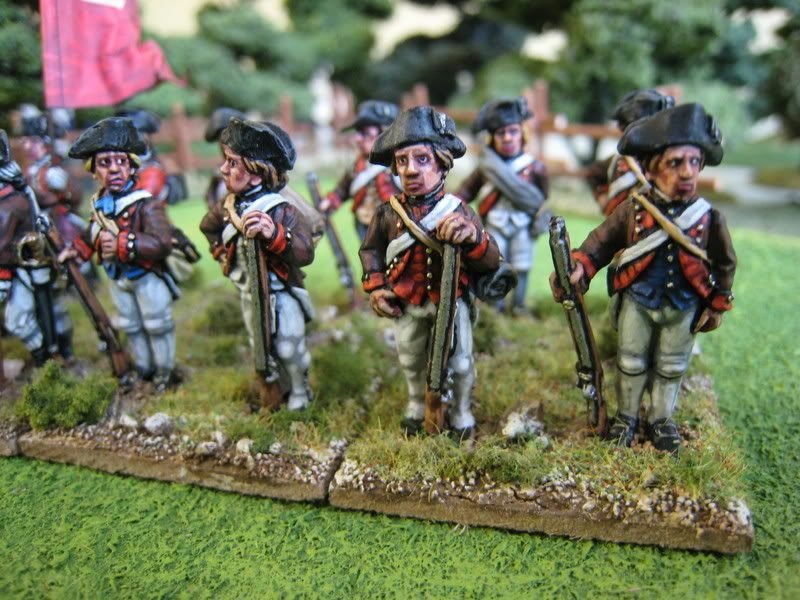 This regiment is listed in the "British Grenadier" Brandywine scenario as a skirmish unit. In the "British Grenadier" rules, Continental regulars rate as second class (i.e. non-elite) skirmishers and when firing roll one set of dice per 3 figures. Therefore I have based this unit on 3 bases of 3 figures each, base size being 25mm x 75mm. 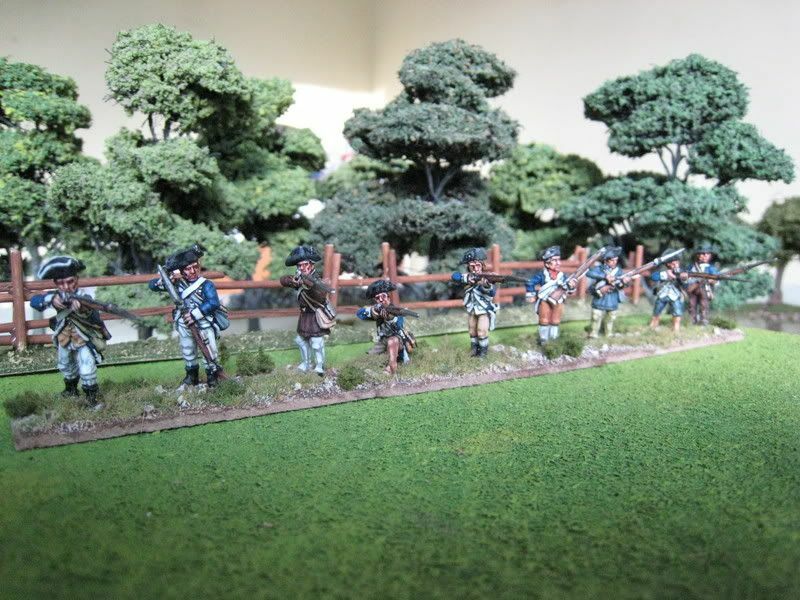 The figures are my usual mix of Foundry, Perry and Eureka and include a couple of Perry hunting shirt types. Painted February 2006. 9 figures. The Queen's Rangers was a loyalist regiment, originally raised by Robert Rogers of French & Indians Wars' fame but commanded during the AWI by Major Simcoe. 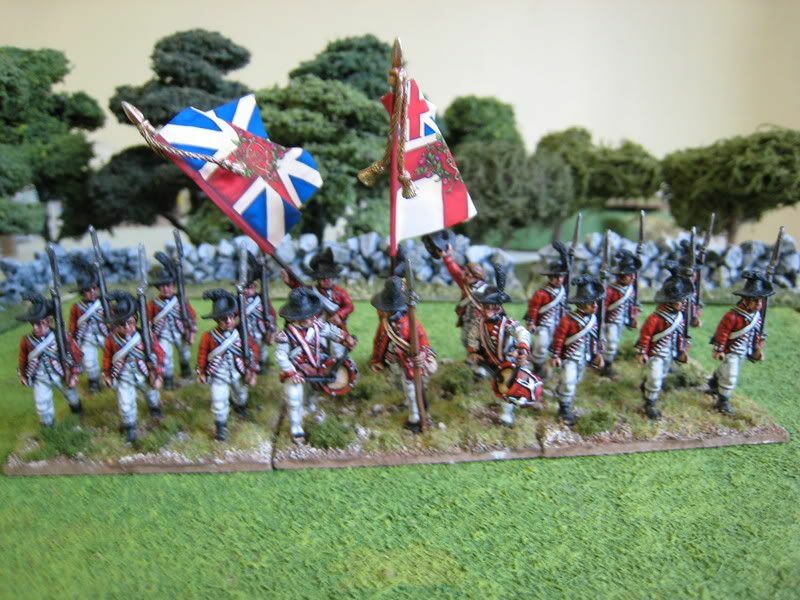 Initially an infantry unit, a Hussar troop was added to the Queen's Rangers in early 1778. Three troops of light dragoons were raised a couple of years later, but the cavalry arm remained relatively small (although irregular units of loyalist horse seem to have been attached to the Queen's Rangers at various times). The hussar troop seems to have averaged between 30 and 80 men. The hussar cap was apparently adopted when a Hessian rifleman shot a Queen's Ranger after mistaking him for a Continental cavalryman on account of the similarity in their respective headgear. 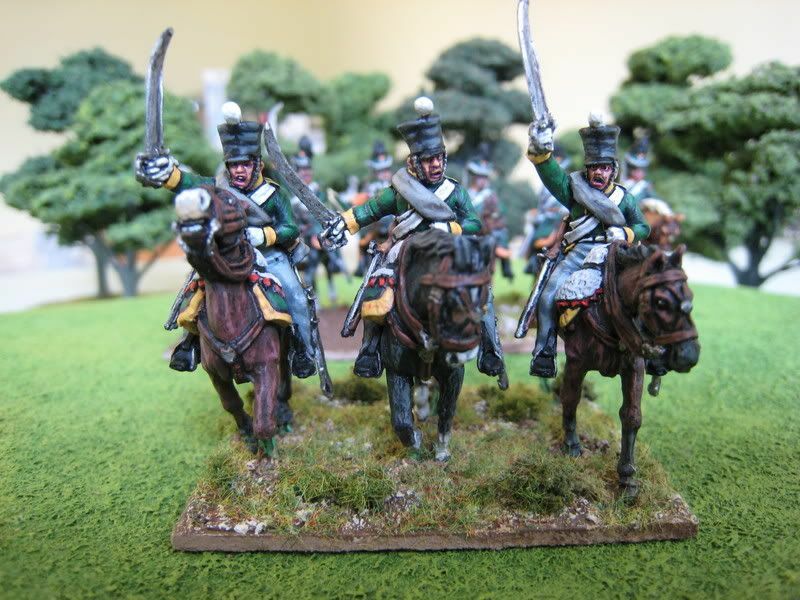 The Hussars fought at Monmouth in 1778 and then throughout the war up to Yorktown. The second photo above shows one of Alan Perry's "self-potraits", that pop up in his AWI figures (and no doubt in other ranges too). 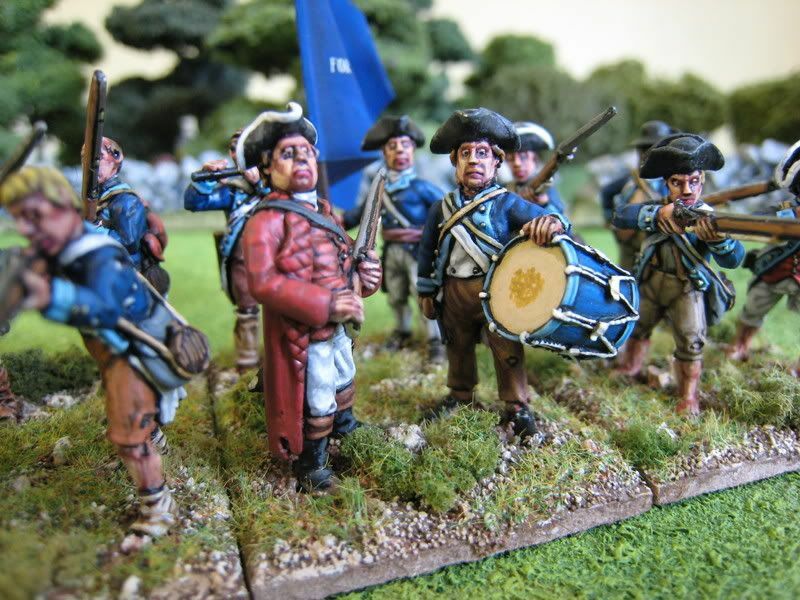 I painted these Perry Miniatures figures a couple of years ago and my method for painting faces was very different to what it is now. I used to use the Foundry 3 colour flesh palette with a chestnut wash whereas now I use a mix of 4 to 5 Games Workshop/Foundry and Coat D'Arms flesh tones with a dark brown wash. This latter method gives more subtle results I think. 6 figures. Painted October 2004. The sun came out earlier and brighter than expected this morning which means I had to stop taking photos (you can see the rather odd lighting effects this causes in some of the shots in previous posts). Consequently I have a slight shortage of photos, although next week will see posts on the Queen's Rangers Hussars, Hartley's Additional Regiment, some British Grenadiers and a few Indian chiefs. In the meantime, here's a work in progress shot of Sherburne's Additional Regiment which is currently taking a back seat to my Napoleonic commitments and may or may not be finished any time soon (I also need to order the figures for the rest of the regiment from Foundry). 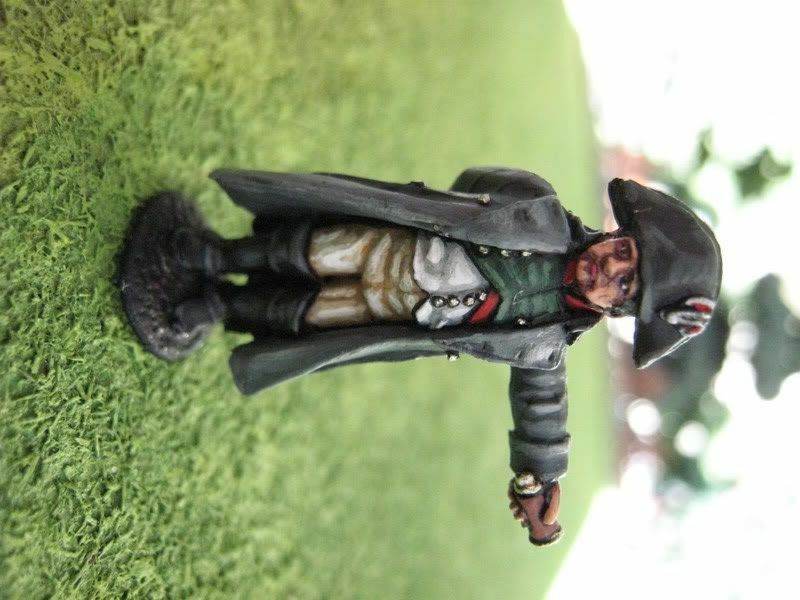 Below is a shot of the Napoleon figure from Perry's 1815 French range, which I painted this morning and isn't even varnished or based yet! I'm working on the rest of the pack this weekend, although I won't be basing them until I see the latest Perry releases, as they include several more packs of high command and staff figures. Putting all these figures together into 3 or 4 interlocking vignettes will take careful planning. 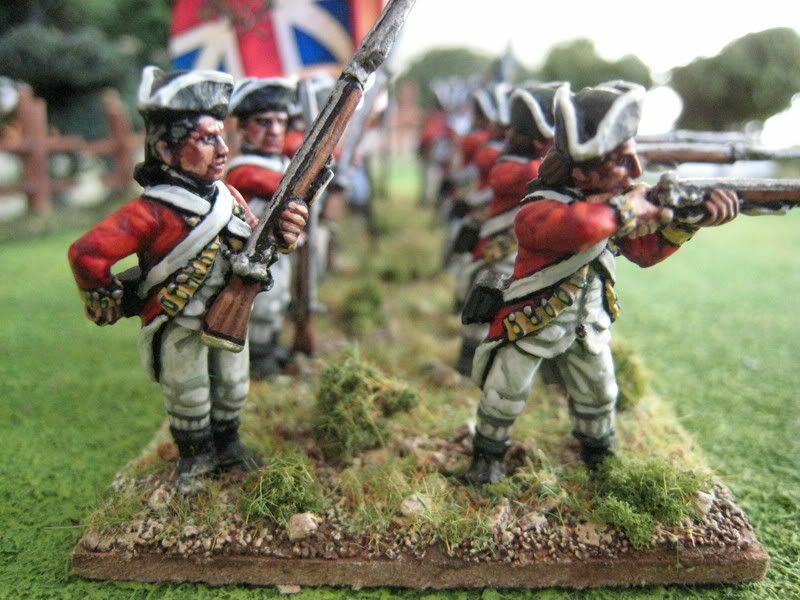 Before Perry Miniatures came along with their packs of Brits in various types of "campaign dress", 25mm manufacturers tended to stick to making Brits in the 1768 Royal Clothing Warrant "full dress" (although most companies made various light infantry figures in slouch hats). 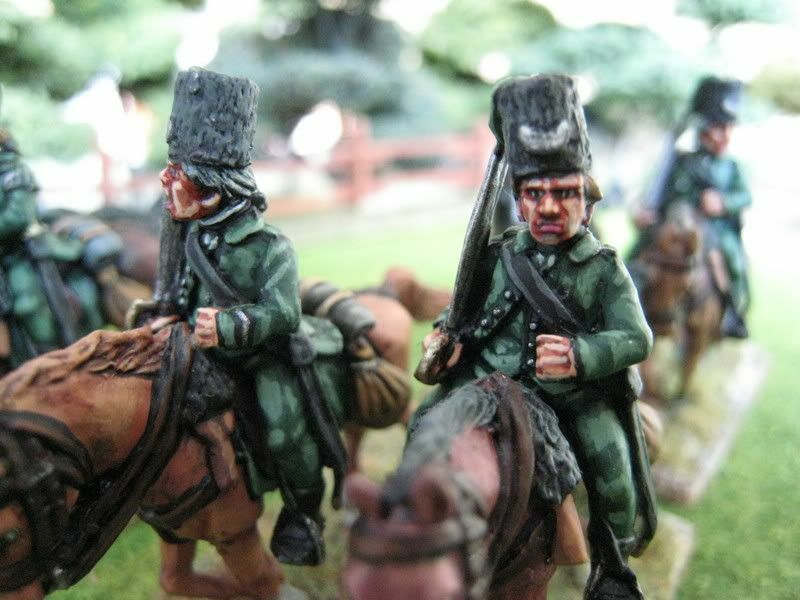 So nowadays the wargamer can choose between the classic look of white-laced tricornes or the new orthodoxy of slouch hats, roundabouts and cut-down coats. Although there is evidence that soldiers began modifying their uniforms as soon as they reached America (and sometimes during the voyage over), I think it is acceptable to use the full dress look for regiments engaged in the early battles of 1775 and 1776. Therefore, I have modelled those regiments that were present at Bunker Hill, Fort Washington and White Plains largely according to the 1768 warrant. All consist of Foundry figures. The 28th was raised in 1694 as Gibson's Regiment of Foot and fought at Ramillies and Fontenoy. It was in the vanguard of Wolfe's attack on Quebec in 1759. Arriving in America in 1776, the regiment saw action at Brooklyn Heights, White Plains and Germantown before leaving for the West Indies in 1778. Painted May 2006. 16 figures. Flags by GMB. The fact that the drummer looks a bit like Gordon Brown is pure coincidence, given that these boys are from Gloucestershire and not Fife. 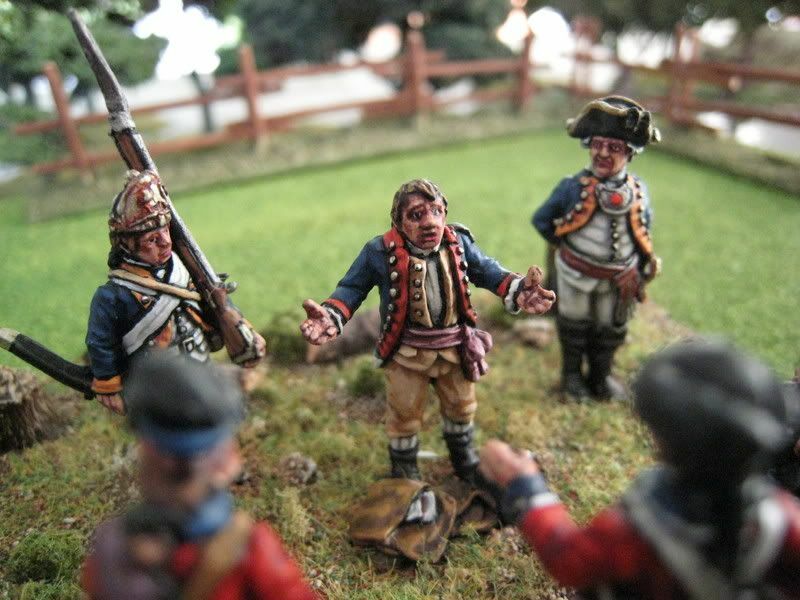 For a few years now Dave Brown and Eclaireur, respective authors of the "General de Brigade" and "British Grenadier" rules sets, have organised large games that take place over a weekend at London's National Army Museum. As well as granting us the space for larger games, the National Army Museum provides an inspiring venue and gives the museum's visitors a chance to see what wargamers do (although this also induces spasms of nervous twitching when youngsters start manhandling and playing with models that are sitting around off-table). In 2004 and 2005 these wargaming weekends featured both a Napoleonic and an AWI game (in the case of the latter, 2004 saw the battle of Monmouth and 2005 the battle of Brandywine). Alan and Michael Perry came along for the AWI games to demonstrate their uncanny ability to throw nothing but double-sixes for prolonged periods. It was noted that Alan's AWI range was nearing the magic "100 packs" mark. Shortly afterwards, I suggested on the TMP forum as a joke that a suitable way of celebrating this landmark would be for Alan to do a "National Army Museum characters" pack. 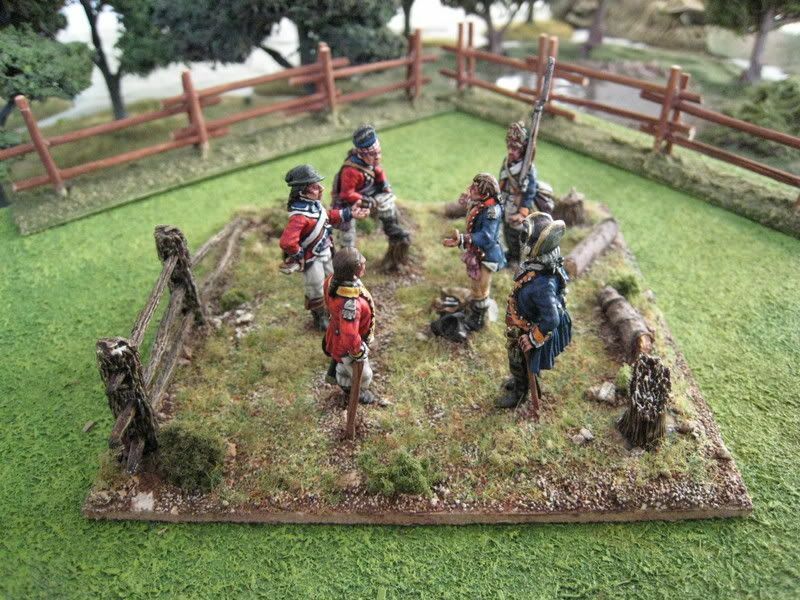 It was then suggested (I'm not sure by whom, perhaps Eclaireur or Alan himself) that a suitable vignette might be a group of British/Hessian officers interrogating Alan, as an allegory of the pestering that Alan has to put with from those of us who are always demanding that he makes specific packs of obscure AWI troops. And so pack AW100 was born. Mug-shots and measurements (our heights, obviously...) were sent to Alan early in 2006, there was a bit of discussion about what uniforms the various, er, "personalities" should be wearing and then in July I received an email from Alan with a picture of the greens he had finished. The likenesses that he has captured in such a small scale are absolutely incredible. The Perries together with other Games Workshop designers have already demonstrated their superb skill as portrait artists through their "Lord of the Rings" figures, so I suppose we should not really have been surprised at how well these figures turned out. But many thanks to Alan for being so game and taking on this capricious idea! In front of Alan are a gesticulating Eclaireur (in the uniform of a Guards officer; of impeccable breeding is EC), Dave Brown in the yellow facings of the 44th Foot (which became the East Essex Regiment in 1782) and myself reading the captured despatches, dressed as an officer in the Black Watch. 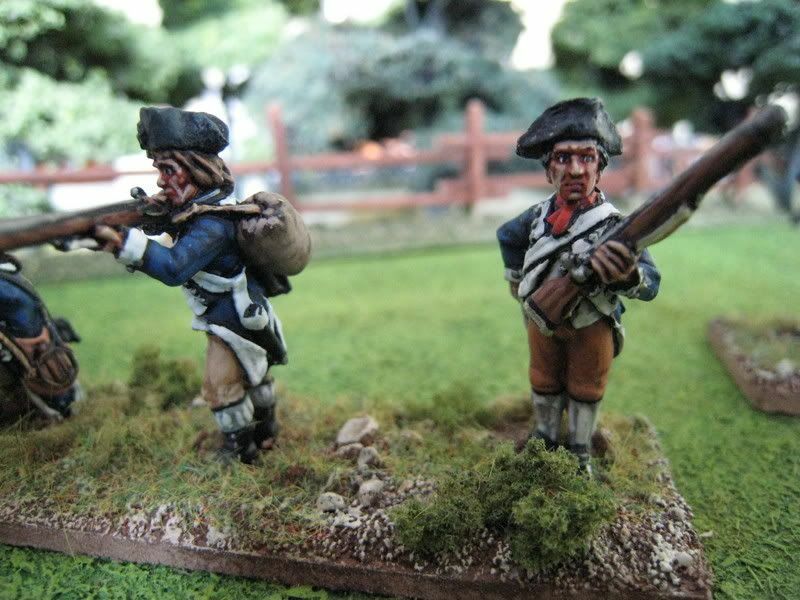 Behind Alan are two Hessians in the orange facings of the von Lossberg regiment. The tall officer is AWI expert and guru Supercilius Maximus (as he is known on TMP) whilst the sentry is a chap I think is called Norbert. I also painted a set of masters for Alan's own collection which he's put up on his site. Painted November 2006. 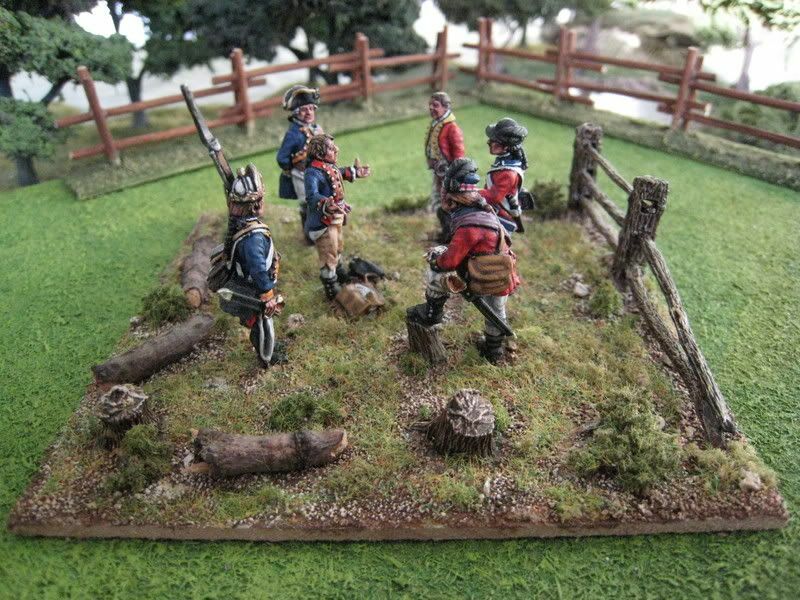 Tree stumps and fence from Redoubt Miniatures. Base size: 100mm x 100mm. Leopold Phillip von Heister (?1707-1777) was the first commander of the troops from Hesse-Kassel which arrived in America in 1776 to fight for the British. He was a veteran of the Seven Years' War and presumably one of the most senior soldiers in Hessen-Kassel. Despite being of advanced age (and he had accepted command whilst acknowledging to the Landgraf that he might not see out the campaign), Heister was described as cheerful, active and healthy, although he expected to be treated with deference due to his long campaigning experience. He had been wounded so many times that he was almost totally lame in one leg. His manners were clearly those of an honourable, old soldier. Lieutenant Piel, a Hessian officer who was taken prisoner at Trenton, recalled meeting the American General Lord Stirling. Stirling "conducted himself in a very friendly manner toward us. He received us with these words, ‘Your General von Heister treated me like a brother when I was a prisoner, and so gentlemen, you shall be treated by me in the same manner…" He took great exception to the reports in American newspapers about Hessian brutality, writing to inform the Landgraf that these newspapers were "nine-tenths lies". Heister seems to have commanded the Hessian troops with efficiency rather than with distinction, but his difficult relationship with General Howe was dealt a knock-out blow by the disaster of the Hessian defeat at Trenton, for which Heister, as corps commander, had to take ultimate responsibility. He was recalled to Hesse in some disgrace in 1777, replaced by Wilhelm von Knyphausen. His spirit broken, Heister died just over a month after his return to Kassel. 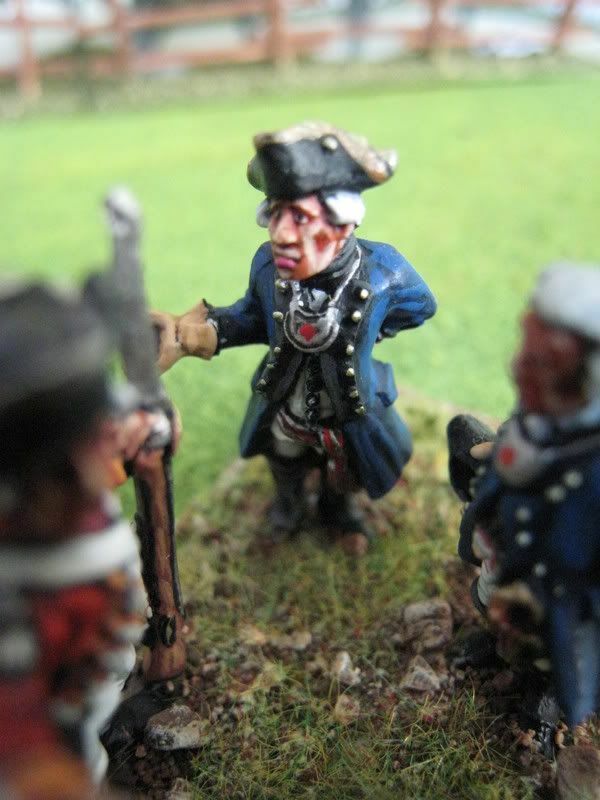 I wanted a command stand of von Heister for the White Plains scenario in the "British Grenadier" scenario book, in which he leads the Crown's forces. 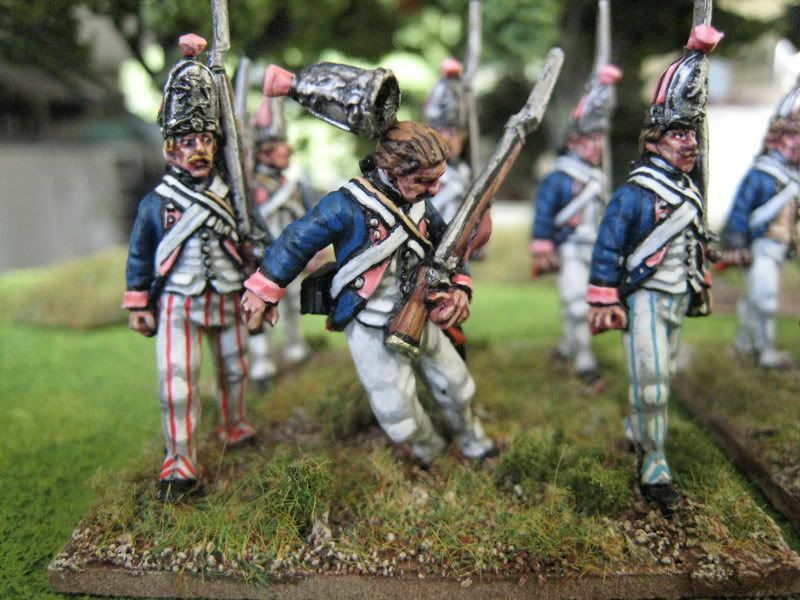 Perry had not released any Hessian staff figures when I painted this set so I raided various Foundry ranges. 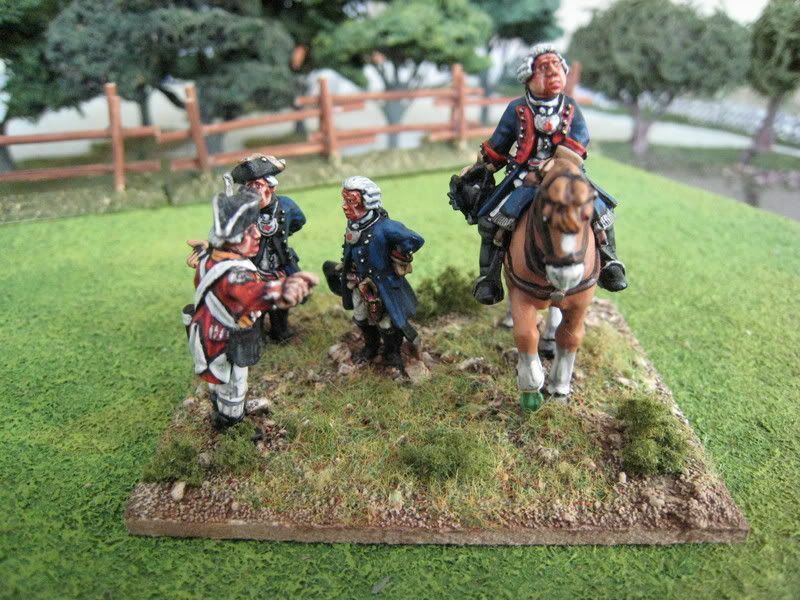 Von Heister himself and his two Hessian aides are from the Prussian Seven Years' War range (sculpted by Mark Copplestone). 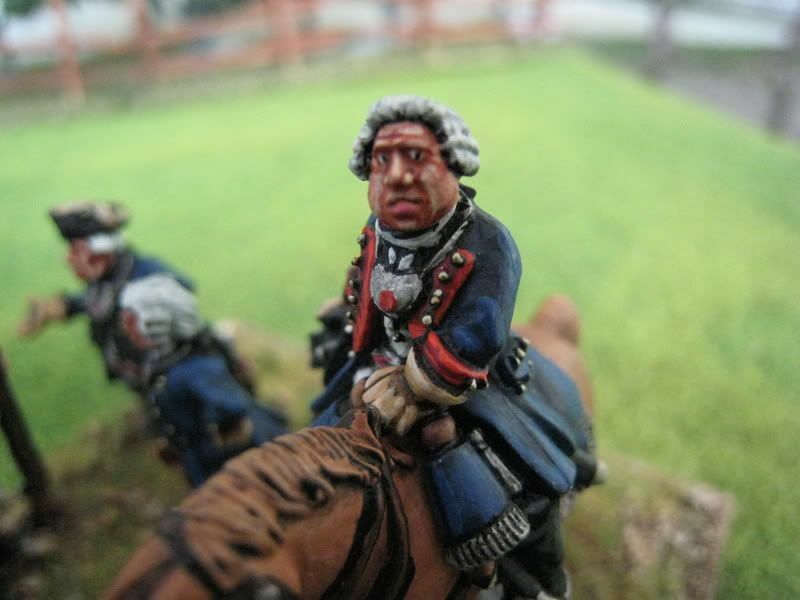 This mounted general figure is suitably jowly for a seasoned campaigner, although I'm not sure that he looks like a man in his late sixties. His uniform is also conjecture, as there are references to Heister being colonel of a "dragoon regiment" which probably involved a different uniform to that shown here. 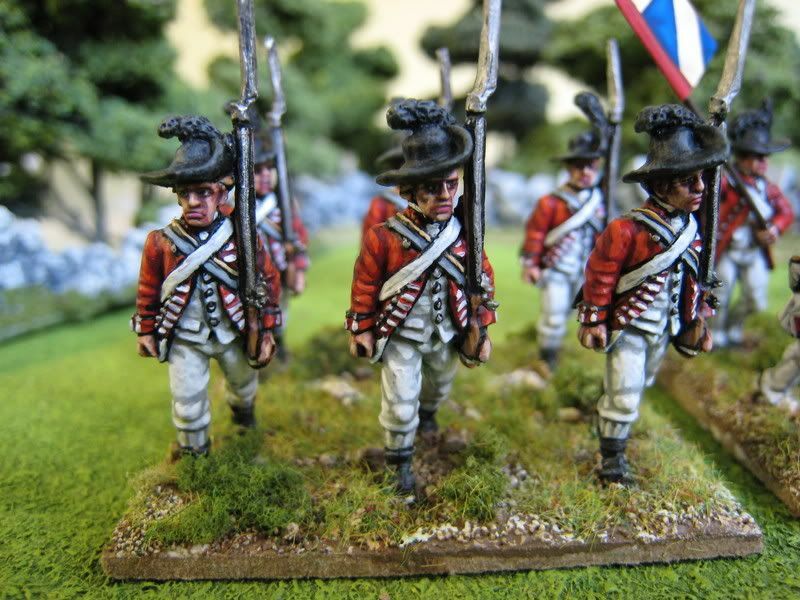 The British aide is an officer from Foundry's AWI range and wears the orange facings of the 35th Foot, a regiment that was present at White Plains. Painted October 2005. According to Mollo, a deserter from this regiment was reported as wearing "brown regimentals faced light blue". Mollo also mentions blue coats faced white. The former is prettier and so that is what I decided to do; in fact, this interesting colour scheme is what inspired me to paint up this regiment (I'm still not entirely sure what battles it fought in...). 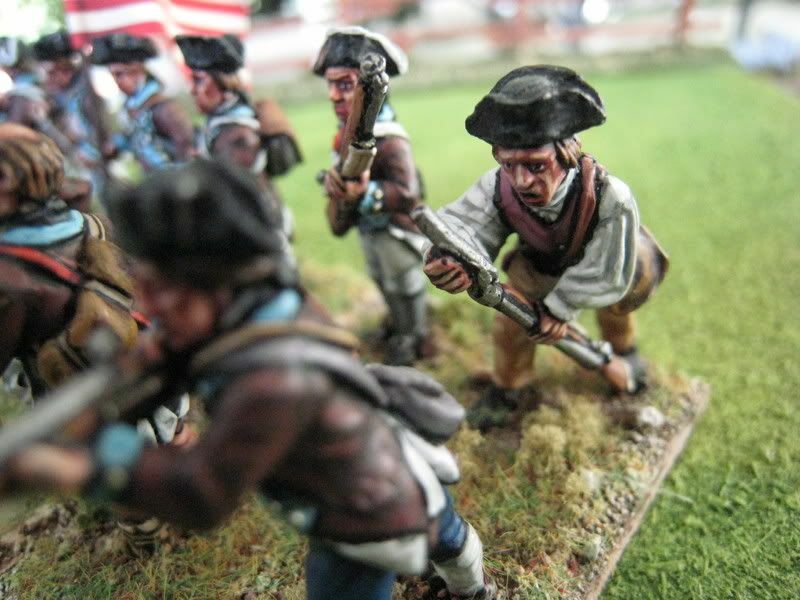 The unit is a rag-bag of figures, mainly drawn from Foundry's "uniformed militia" and "minutemen" packs. 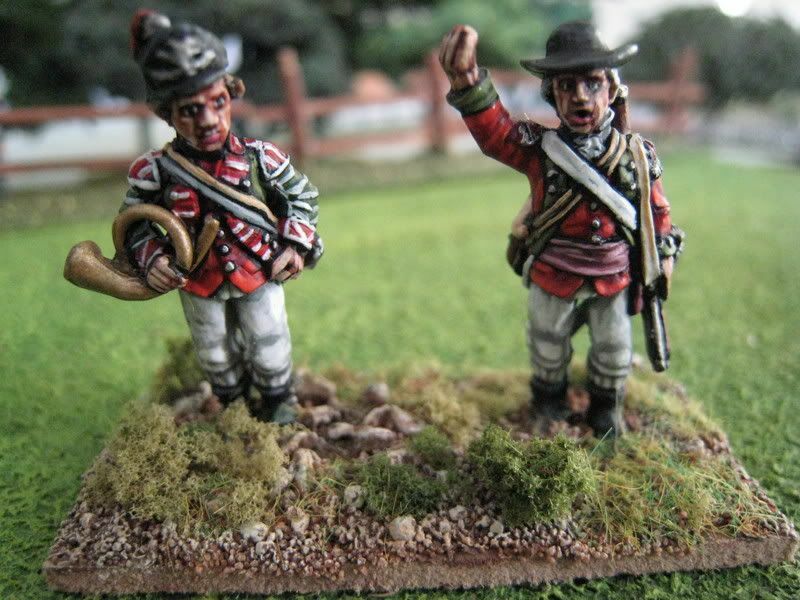 There are a couple of figures from Eureka and the standard bearer is from the Perry range. It therefore combines soldiers in scruffy uniforms with those in civilian clothes and looks about right for a poorly-supplied state regiment in 1777/78. Painted August 2006. 20 figures. Flag by GMB. I spent the summer of last year ploughing through 7 packs of Woodland Indians and Iroquois from the Perry and Conquest ranges. The main photo shows the contents of packs "Woodland Indians A to C" from the Conquest range: these are generic figures and Conquest also make specific packs for the Delaware, Saux and Iroquois tribes. Below are a few close-ups. I wanted to make these figures look authentic and suitably intimidating. Therefore, they all wear war-paint and tattoos and I have added decoration to the satchels, leggings etc. 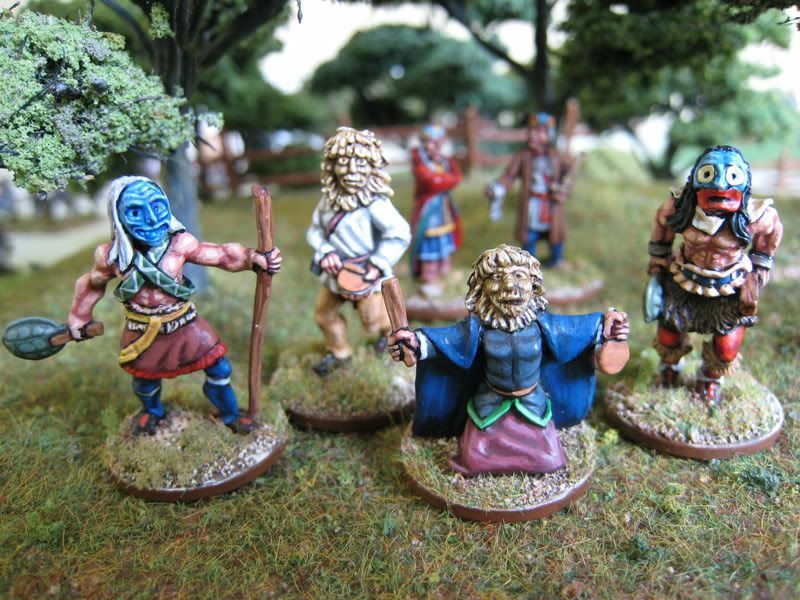 I found the Osprey books on woodland tribes invaluable when painting these figures. I also decided to base them individually, on 25mm x 25mm bases. 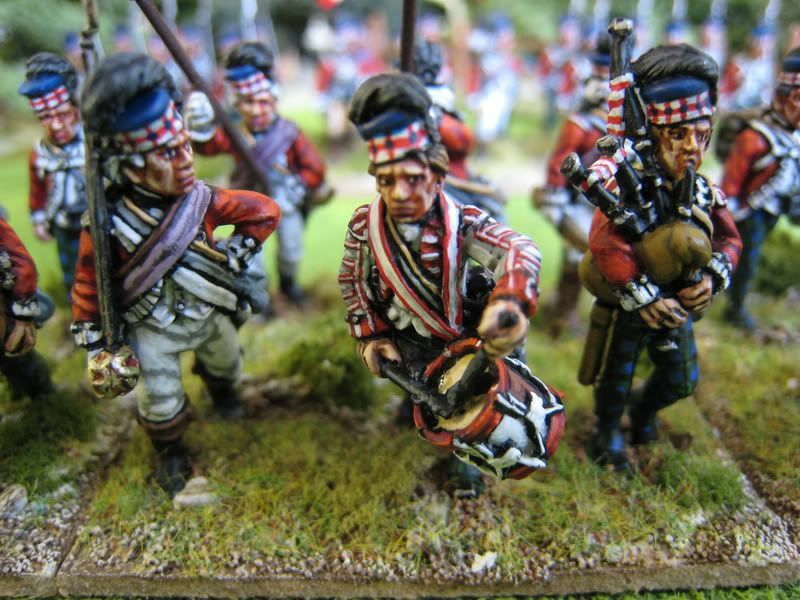 The "British Grenadier" rules suggest that skirmishers be based in threes or twos, depending on their grade (the point being that when firing the better skirmishers roll one set of dice for each pair of figures whilst everyone else has one throw for each set of three figures - basing in twos or threes makes rolling the dice easier). 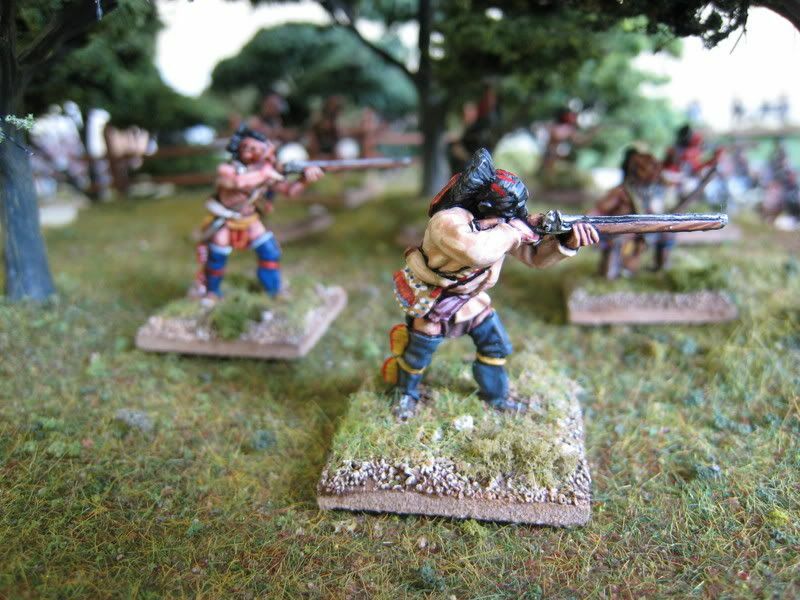 These Indians rate as second grade skirmishers under the rules but I thought basing them on 25mm x 75mm bases (like my American skirmishers, for example) would just not look right. In any event, with a bit of gaming experience I have learnt that "British Grenadier" can easily accomodate some varieties in basing, as long as the core line troops are based consistently. In the British army, grenadier companies were detached from their parent regiments and combined together into composite, elite battalions. A similar arrangement was undertaken in the Hessian army. Colonel Friedrich Ludwig von Minnigerode's battalion consisted of the grenadier companies of the Erbprinz, Ditfurth, Lossberg and Knyphausen regiments (each of which can be clearly distinguished by their differently coloured facings). This unit fought at Long Island, White Plains, Brandywine, Germantown and Monmouth. It was stationed at New York from 1778-83 and took part in the British expedition against Charleston in 1780. 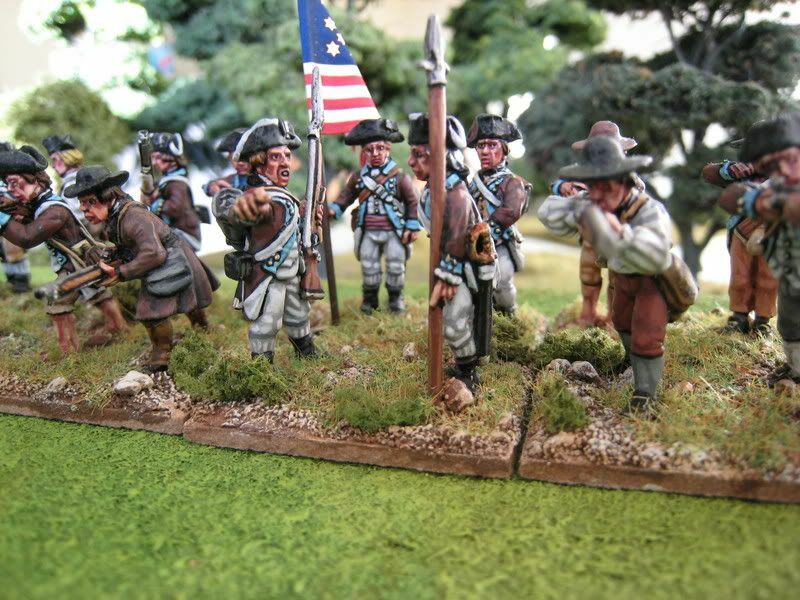 This battalion was one of the first Hessian units to arrive in America. A diarist who witnessed the departure of the troops in Kassel noted that the grenadier battalions were very eager to get to grips with the enemy, in contrast to the lack of enthusiasm shown by other regiments. An officer in a sister grenadier regiment who took part in the landing at Long Island in August 1776 saw American riflemen withdrawing before the Hessians after a half-hearted exchange of fire and wrote "you can well imagine how our Hessian grenadiers gnash their teeth with eagerness, because they cannot run on these rascals...". Much scorn is directed at the Hessian "mercenaries" who fought for King George in the war, but the best Hessian regiments were excellent, well-motivated troops. 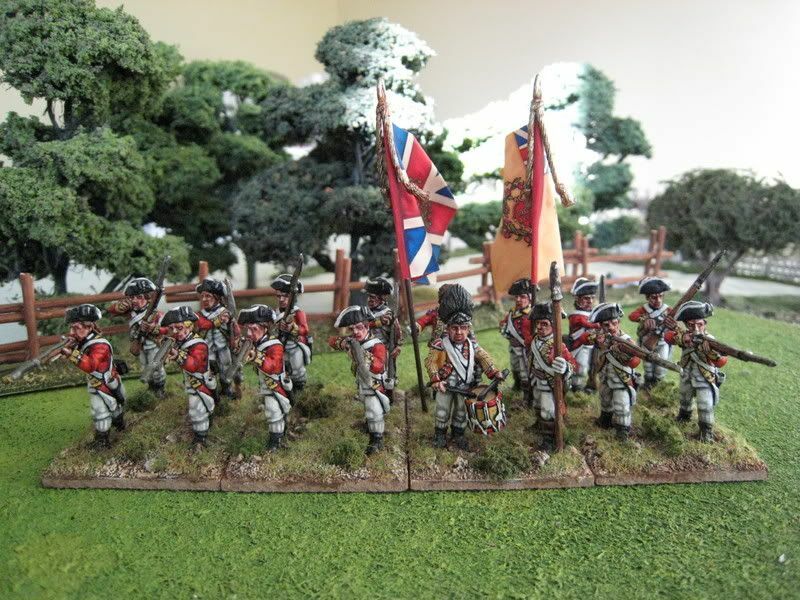 These are from the Perry Miniatures range. Painted June 2006. 24 figures. 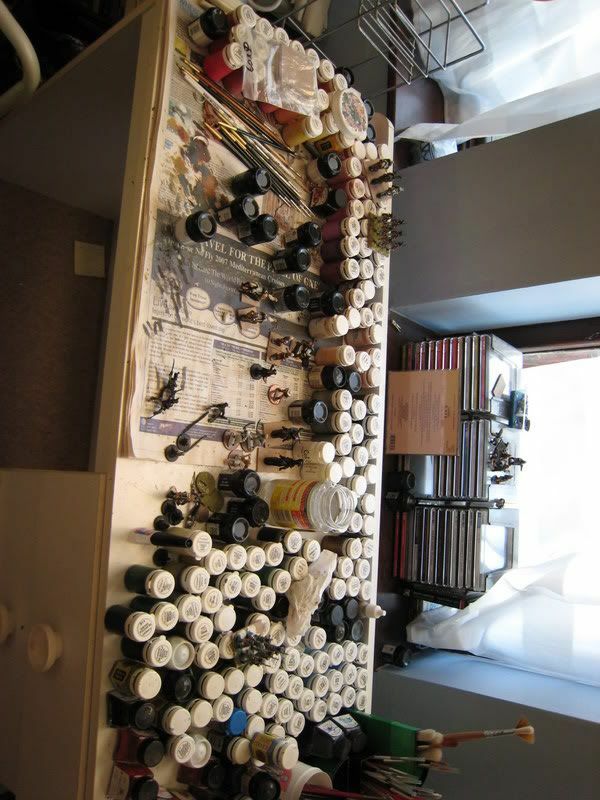 ...and a photo of my very untidy painting desk! I was thinking last night about what I want to work on this year. 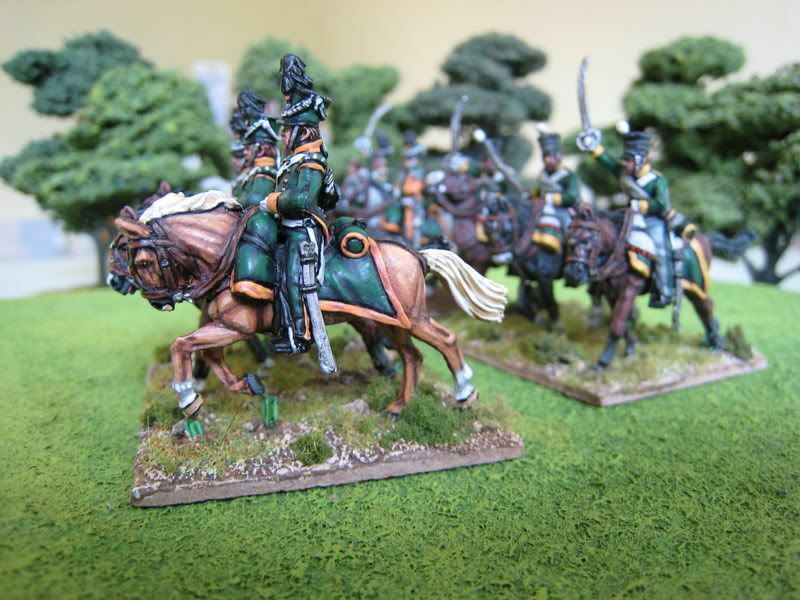 First up is the Napoleonic Dutch-Belgian light cavalry brigade I mentioned in my first post (below are a couple of work-in-progress pictures - all 25mm Perry Miniatures figures). 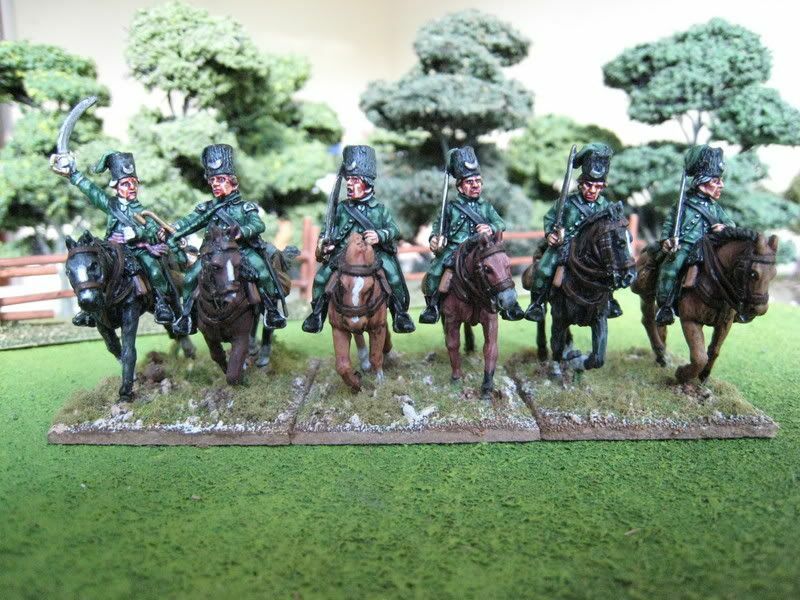 There are 44 cavalry to be completed, of which I've finished 15! Plus I need to do a command vignette of Napoleon and his cronies. That will occupy the majority of time until the end of April (I will be in New Zealand for the whole of March). On the AWI front, I have been working through a rather large leadpile (at the end of 2005 I was convinced that Foundry was about to go bust, so I stockpiled loads of figures!) that will see the 4th Foot, 15th Foot, 63rd Foot and various as yet untitled American units finished. 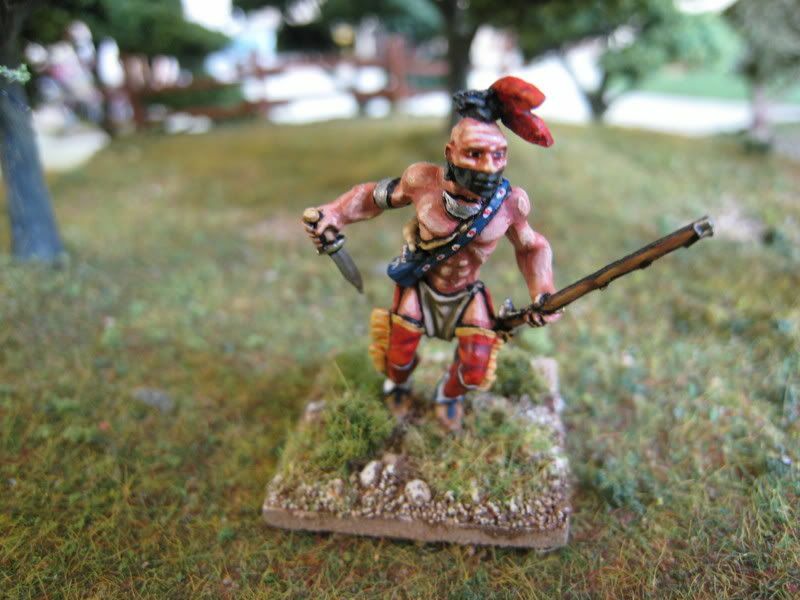 I also want to finish a large Woodland Indians sub-project that I began last summer, working through all the figures currently produced by Perry and Conquest: 39 have been finished, leaving a further 45 to do. 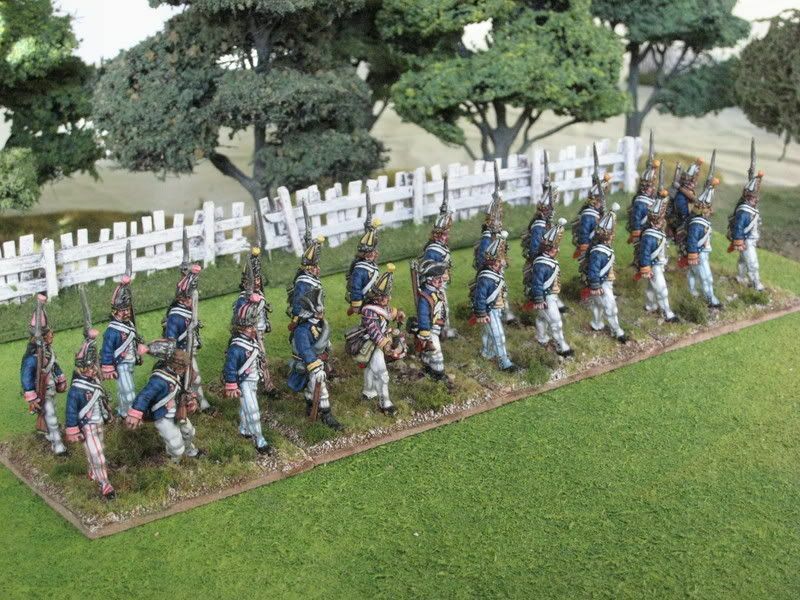 I am painting these primarily to refight the battle of Oriskany at some stage but also with a view to some French & Indian War skirmish games. I don't really need so many Indians, but they are great fun to do. Like many gamers, I imagine, I like to listen to music whilst I paint figures. Usually I put on whatever's close to hand, but last week I started thinking about what music would have been familiar to British concert-goers at the time of the AWI. Contrary to popular belief (and those who think that British music began with the Beatles), Britain in the latter half of the 18th century was one of the must musical countries in Europe, having an abundance of home-grown talent and a vibrant concert scene which enticed established composers and performers from the Continent to visit and, in some cases (such as Handel, JC Bach and Haydn), to remain in the country for prolonged periods. As well as London, regional capitals such as Bath, Coventry and Manchester were home to flourishing musical activities. So what music would Messrs. Clinton, Cornwallis, Howe and Burgoyne have had on their iPods and what would George III have played on his harpsichord? I have delved deep into my cd collection and put together a Top Ten of the era's greatest musical hits. All the music below has been recorded on the Hyperion Records label. 1. George Frideric Handel: "Judas Maccabeus". Handel was George III's favourite composer, since he grew up surrounded by his music (often quite literally). Handel died in 1759 but George's admiration for his music helped ensure that it continued to be regularly performed. Military men would have enjoyed the oratorio "Judas Maccabeus", written in 1747 to celebrate the defeat of Bonnie Prince Charlie and which features the stirring chorus "See, the Conqu'ring hero comes". 2. Thomas Linley: "The Tempest". Thomas Linley the younger was a prodigy, whose death in 1778 at the age of only 22 was a tragedy for English music. Mozart called him a "true genius". His works include incidental music for a production of Shakespeare's "The Tempest" at the Theatre Royal in Drury Lane in 1777. General John Burgoyne wrote plays that probably had incidental music and consequently he may have known of Linley. 3. Samuel Wesley: Violin Concerto in D Major. The Methodist Wesley family arranged concerts at their family house in Marylebone and Samuel (1766-1837, son of the famous writer of hymns) composed seven violin concertos for those events between 1779 and 1785. His D Major concerto dates from 1781; its sunny disposition belies the events unfolding at Yorktown. 4. Thomas Arne: Concerto No3. in A Major. This list would not be complete without some music by Thomas Arne (1710-87), the composer of "Rule Britannia". Arne wrote 6 concertos and much other music for keyboard and George III, a keen harpsichord player, would have known his work. This concerto was written in the late 1770s for the new "piano e forte". Pianos became common in London in the 1770s and composers were eager to write or revise works for this new instrument. 5. Joseph Haydn: Symphony No.70. Haydn stayed in London during 1791/2 and 1794/5 and during the latter visit penned his well-known "Military" and "Drumroll" Symphonies (numbers 100 and 103 respectively). I'm sure our AWI generals would have enjoyed the vigour of those works. Haydn's Symphony No.70 is not as well known but just as fiery. It dates from 1779. 6. Joseph Key: "As shepherds watched their fleecy care". People went to church regularly in those days and Key's setting of a favourite Christmas theme (dating from the early 1780s) was one of the most popular carols in the Georgian repertory. 7. JC Bach: "Farewell to Lochaber": Johann Christian Bach, son of JS Bach, settled in London in 1762. He became Music Master to Queen Charlotte and gave her singing lessons. Whilst the evocation of Scotland may have been a bit too Jacobite for the Royal Household's liking, Bach's arrangement of the folk-song "Farewell to Lochaber" was a hit with London audiences during the 1770s. 8. Carl Friedrich Abel: Quartet in A Major. Abel was another of Queen Charlotte's chamber musicians, who arrived in London in 1758 and remained there until his death thirty years later. His A Major string quartet was part of a set (Op.8) that was published in 1769. These were among the first string quartets to be published in England, and one can imagine George III, who played the violin as well as the flute and harpsichord, being delighted at a court composer producing works in a novel form that the king himself could try out. 9. William Jackson: "Love in thine eyes for ever plays". This beautiful song, composed for two sopranos, cello and harpsichord, is the sort of thing that Mr and Mrs King might have played together in Buckingham House with JC Bach and other household musicians. It was published in 1782. Jackson would then have fallen out of favour with George as he condemned the extravagent Handel Commemorations of the later 1780s as showing exaggerated veneration of the composer, to the detriment of contemporary "local" composers. 10. Anonymous: "The British Grenadiers". Surely one of the best marching songs ever written (this post's title is the beginning of the first line), its origins are lost in the mists of time but the tune itself is thought to have been written in the 1600s. The march is noted as having been played by the British army at the Battle of Brandywine in 1777. Hyperion have recorded an arrangement for tenor solo, chorus and small orchestra which dates from about 1770. Like the 23rd Foot, the 33rd saw extensive action in the war. It landed in America in 1776 and remained until 1781, fighting at Long Island, Fort Washington, Brandywine, Germantown, Monmouth, Camden, Guilford Courthouse and Yorktown. It is therefore a useful regiment to have in one's collection. It also has red facings, one of only three British regular AWI regiments to do so (the others being the 53rd Foot and 59th Foot). The regiment was originally raised in 1702 as "the Earl of Huntingdon's Regiment" to fight in the War of the Spanish Succession and recruited primarily from west Yorkshire. During the AWI the regiment attained an envied reputation for its professionalism and general excellence both in the field and in barracks. These Perry figures are in campaign dress of "slouch hats" and cut-down coats. These represent field modifications to the 1768 Royal Clothing Warrant regulations, the hats being more effective at shielding the men from the sun than the regulation tricornes. Painted November/December 2006. 18 figures. Flags by GMB. 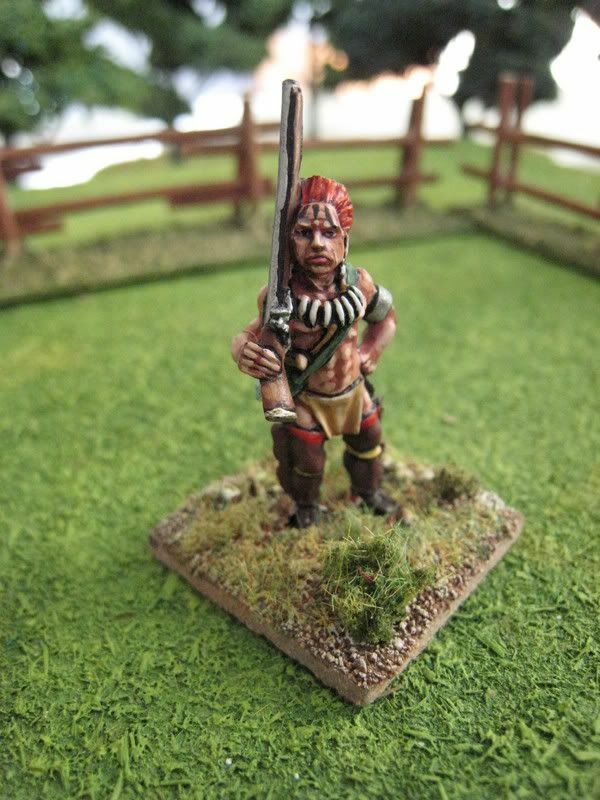 I will shortly be posting some images of woodland indians, but here as an appetiser are the six figures from Conquest Miniatures' "Iroquois Civilans" pack. The first photo shows four Iroquois ritualists, two wearing maize corn husk masks and the other two wearing more general false face masks. Medicine societies wore these masks whilst delivering prayers and thanksgiving songs to deities and earth-bound spirits. The Husk Face Society prayed to agricultural spirits and celebrated the supernatural beings who taught man the arts of hunting and agriculture. The False Face Society ritualists are holding turtle shell rattles in their right hands. 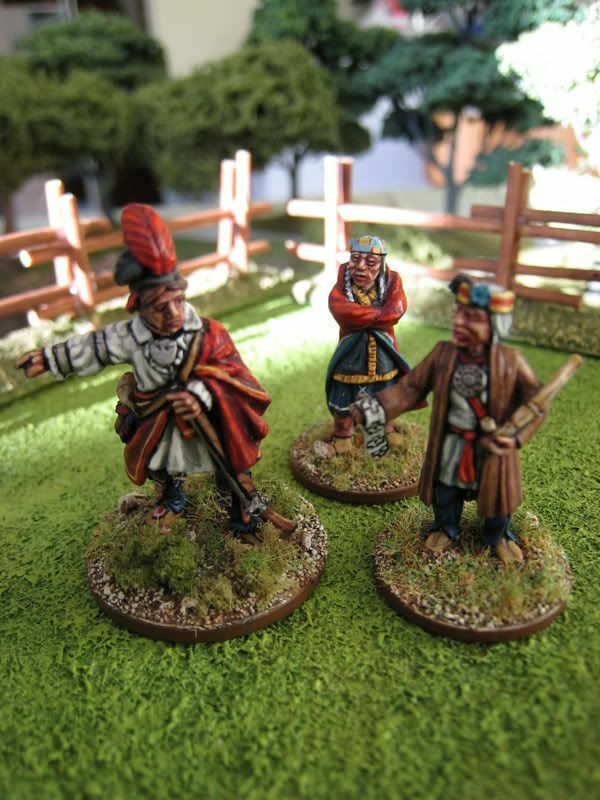 In the background are the last two miniatures in the "Iroquois Civilians" pack, a clan matron and a sachem. They also appear in the photo below together with the Joseph Brant figure from the Perry "Indian Chiefs" pack (at some stage Brant will have a post all to himself). The sachem holds a treaty belt of wampum beads (which were made from the round clam shell, found along the Atlantic coast). White wampum, as shown here, signified peace and purity. 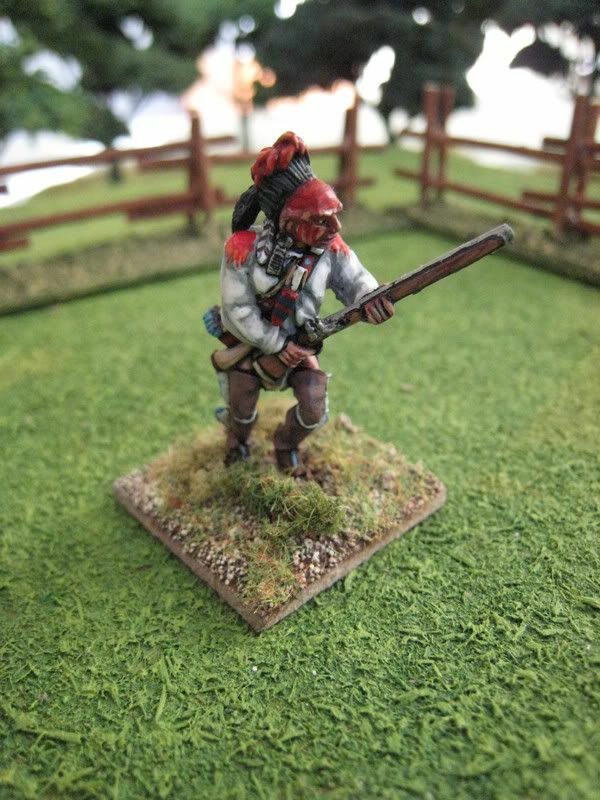 These are very well-made, interesting figures which would also fit in as extras in a French & Indian Wars game. 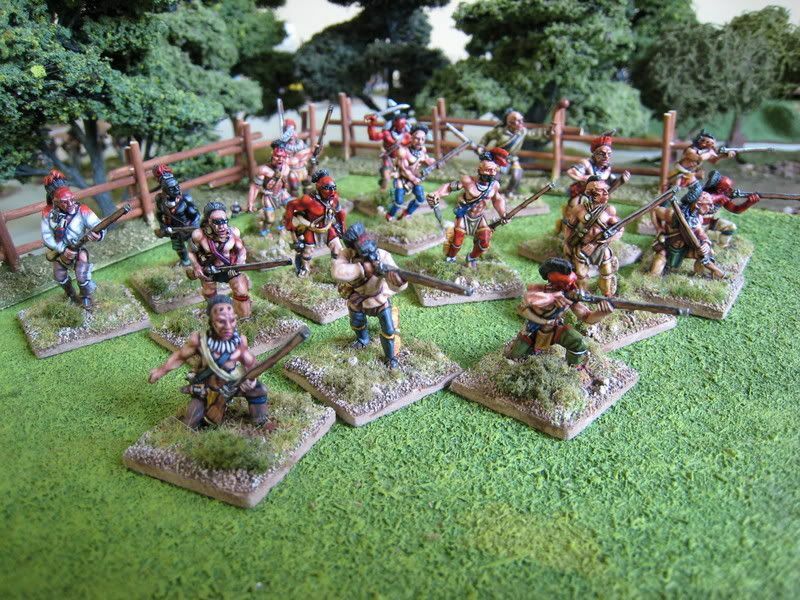 If and when I manage to realise my plans for a game of the Battle of Oriskany (1777 - essentially a large and bloody skirmish between Iroquois and American militia), these civilians will be on the table somewhere with some longhouses to add a bit of native colour. Anyone painting up Iroquois is strongly advised to look at three Osprey Men-At-Arms titles, No.228 "American Woodland Indians", No.395 "Tribes of the Iroquois Confederacy" and No.428 "Indian Tribes of the New England Frontier". All three books contain extensive information about Indian clothes, war-paint and decorative work as well as the tribes' customs and history. Painted July 2006. 6 figures. This regiment typifies the problems of research into the uniforms worn by Continental units. According to Blandford's "Uniforms of the American Revolution" by Mollo & McGregor, "in the winter of 1776/77, the former 6th Pennsylvania Battalion was reformed as the 7th Pennsylvania Regiment. Under this title it served until January 1781. The regimentals of the corps appear to have been blue with red facings..." Hmm..ok, but no authority is given for this statement. An online search revealed a few sites which thought the regiment was uniformed in brown faced red regimentals. 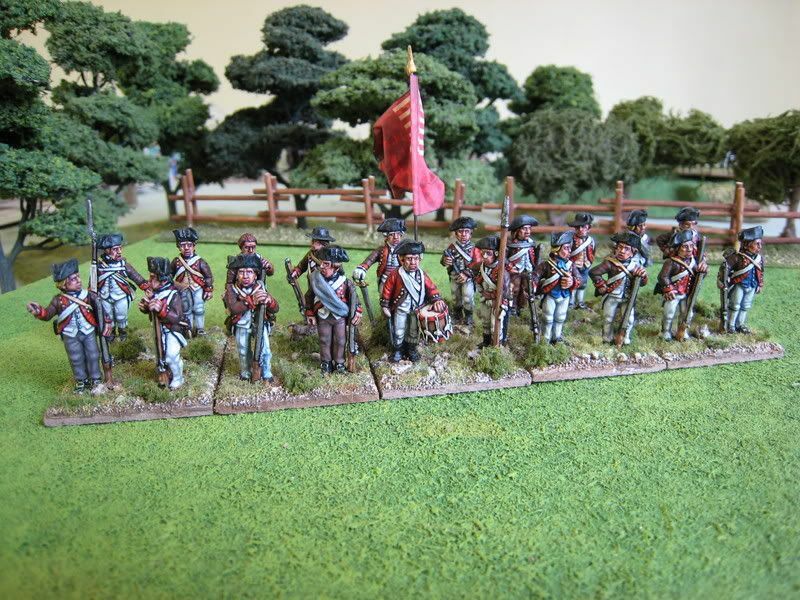 Again, not much in the way of evidence and "brown faced red" seems to be a default option for Pennsylvanian units just as "blue faced red" is the default option for Virginian regiments. Perhaps they wore neither. So who knows? I plumped for brown faced red because I already have lots of blue faced red units and fancied a change. Also, I had found a flag that was specifically advertised as being that of the 7th Pennsylvania and its deep red colour sits better with the brown and red coats. The rank-and-file figures are from Foundry's "militia standing easy" packs. Painted September 2006. 20 figures. Flag by Flag Dude (available in the UK from TM Terrain, already attached to the pole and "furled"). Originally raised in 1756 and designated as the 78th Regiment of Foot, the 71st was officially raised by Lieutenant-General Simon Fraser, Master of Lovat, in the 1770s for service in America. The regiment fought at Brandywine, Cowpens and Yorktown. Two battalions were raised and both seem to have served in the war. Here are both battalions arrayed for battle as they might have appeared at Brandywine in 1777, where they formed a brigade with the 42nd Foot under Major General Leslie. 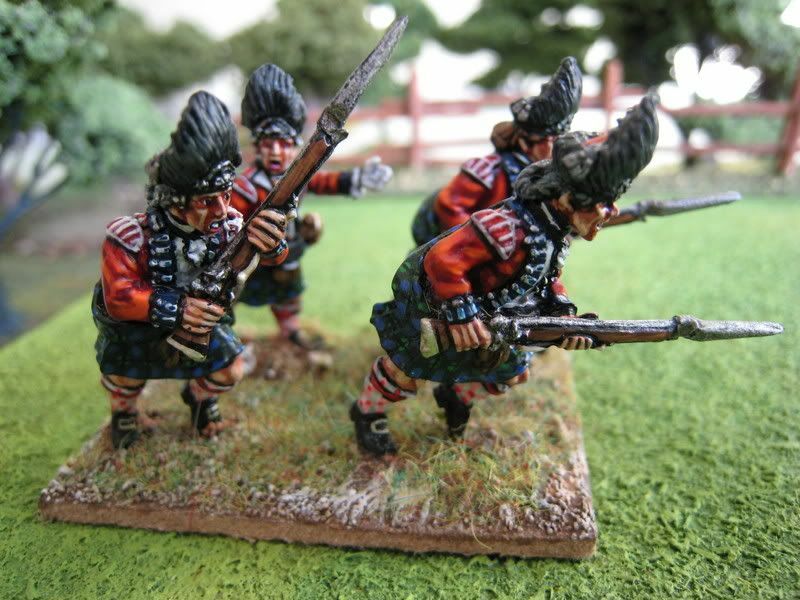 The figures are by Perry Miniatures, who make highlanders in both "early war" and "late war" dress. 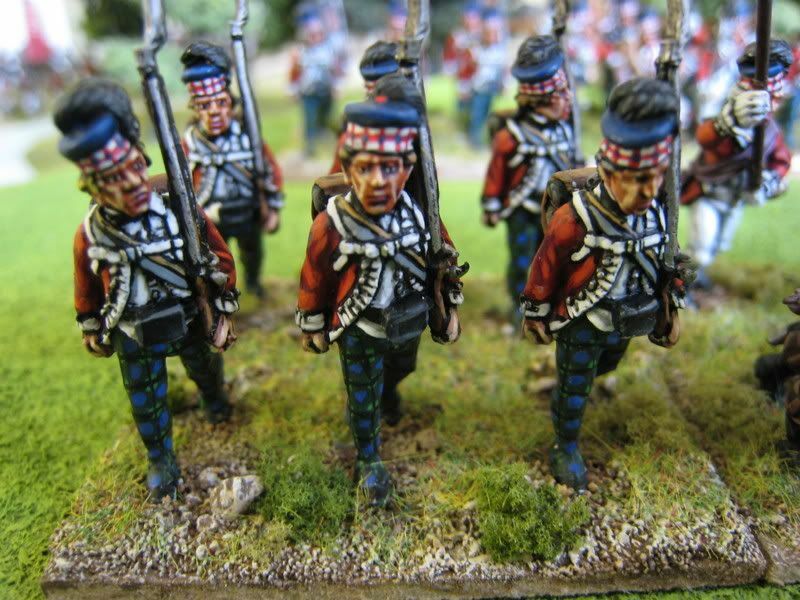 The early war figures wear kilts and full plaid; I used these for my "Black Watch" regiment. The late war figures, seen here, replace the kilt with overalls and abandon the plaid in favour of simpler (and cooler) dress. I painted the overalls in tartan after seeing a painting by Don Troiani of the regiment dressed in trews at the Battle of Cowpens. The tartan is the standard "government sett" that all highland regiments wore in this period. I hand-painted the second battalion's two flags as sources suggest that the flags were diffentiated from those of the first battalion by the addition of a gold "pile wavy" in each upper right-hand corner. 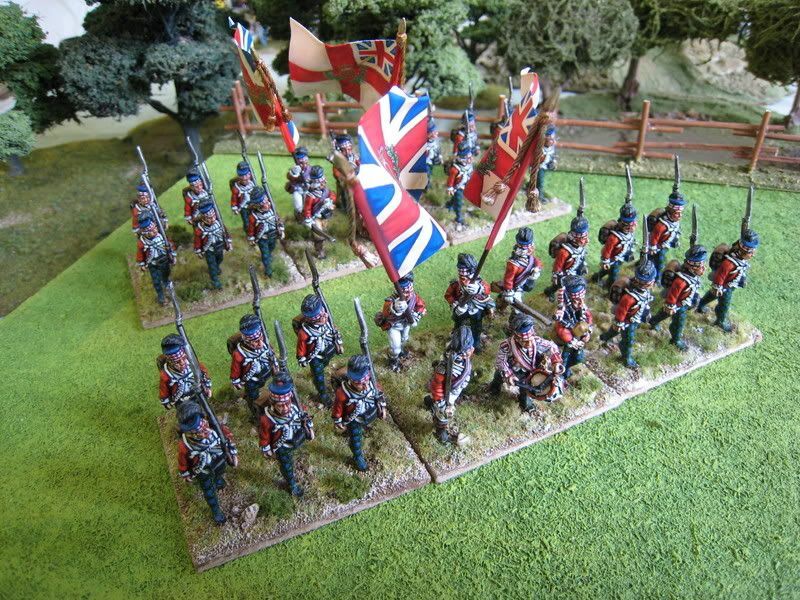 I had intended to paint those wavies on a second set of GMB flags, but the units were needed for a Brandywine game and the flags did not arrive in time (despite GMB's very best efforts). 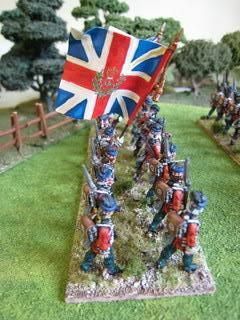 So the flags you see, in the rear unit, were painted in the early hours of the morning on the day re-fight of Brandywine began! Painted October/November 2005. Two battalions of 18 figures each. Flags by GMB (first battalion) and myself (second battalion). It is important to state at the beginning that the issue as to what uniforms were worn by American troops in the AWI is a historical minefield. In short, no one really knows. Much of the information about what certain regiments wore is taken from deserter descriptions and so may well be inaccurate or not representative of regiment as a whole. Uniforms also changed during the course of the war, dyes faded and varied from batch to batch and captured British uniforms were also employed. Some regiments would have been made up of companies that were probably each uniformed differently. Add consistent problems of supply and the only certainty is that the Continental Army, at least before the reforms of 1779, was not uniformed in a consistent or efficient manner. It is therefore important to appreciate that 100% accuracy in modelling American troops is almost impossible to attain. 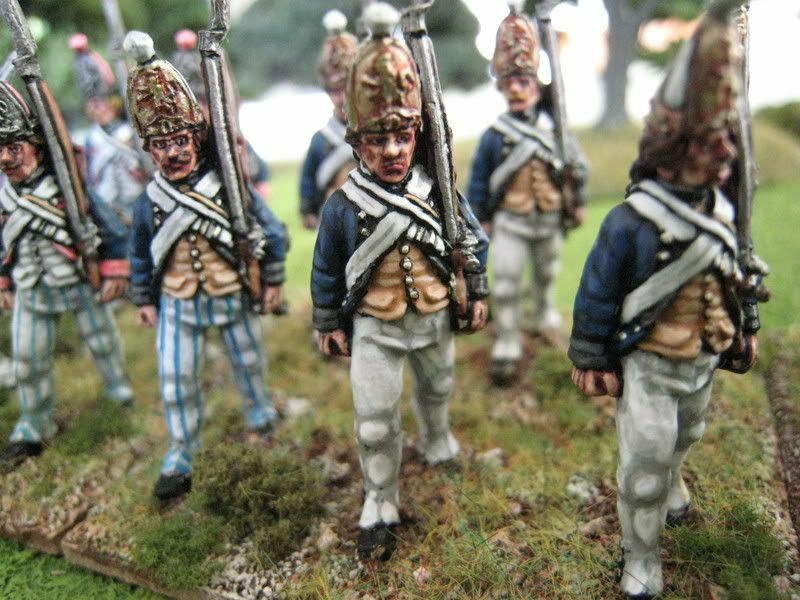 For aesthetic reasons, I think that a certain amount of uniformity within a regiment is desirable but the large variety of figures currently available allows for units to be built which do not look as "uniform" as British regulars. The approach I have adopted with the Americans is to see whether the sources suggest that a particular uniform was worn and then "rough" the figures up a little with different coloured waistcoats and breeches. 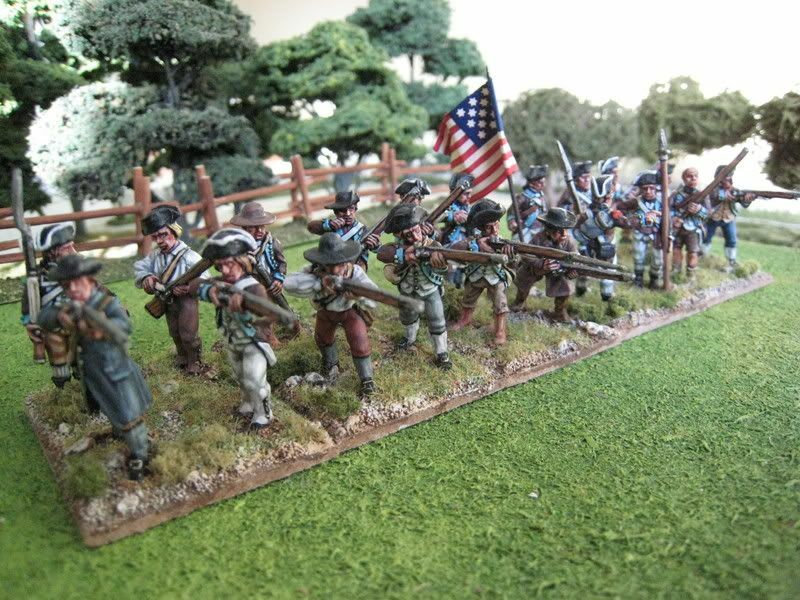 The Foundry and Perry ranges give you American troops in full uniform coat, shortened-down coat (in the Foundry "uniformed militia" packs), civilian clothes and hunting shirt, while Eureka Miniatures offer a range of battered-looking, "ragged" men. These ranges between them allow for plenty of variety. 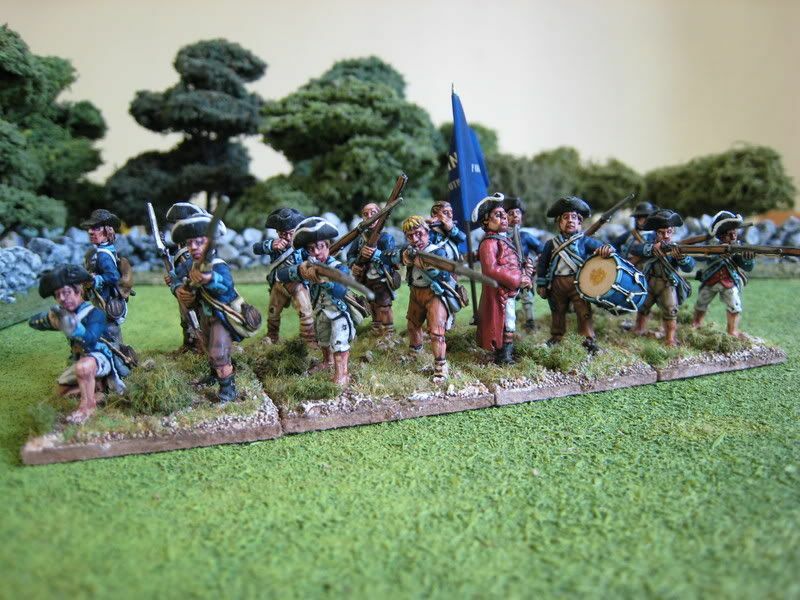 So for this representation of the 2nd Virginia regiment, I have kept the figures in dark-blue faced light-blue coats and ensured the rest of the clothes are pretty grubby. 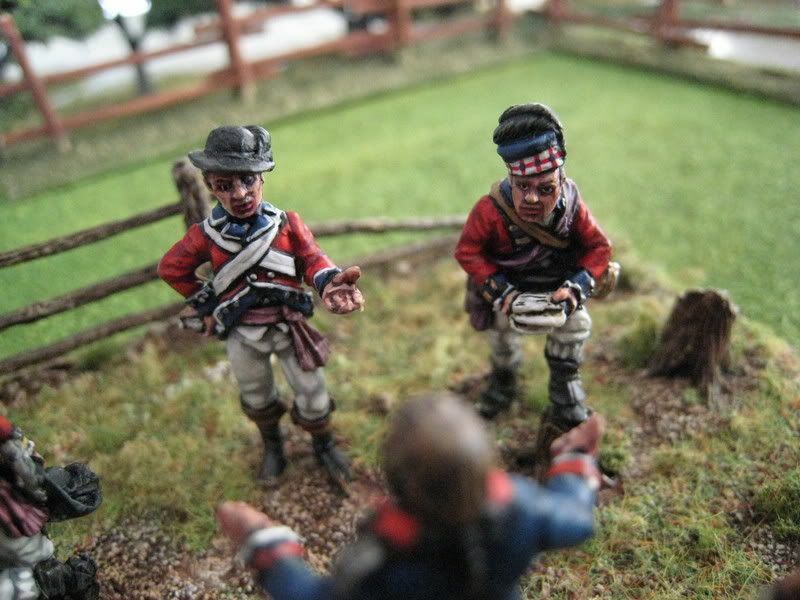 The figures are all from Eureka Miniatures' "ragged Continentals" range, which shows the troops as they would have looked after a year or two in the field, desperately short of proper clothing and shoes but still determined to see off the British. Painted December 2006. 16 figures. Flag, bearing the legend "Virginia for Constitutional Liberty", by GMB. The 23rd Foot fought extensively in the war and was present at the battles of Lexington/Concord in 1775, Fort Washington, Brandywine, Camden, Guilford Courthouse and finally Yorktown in 1781. 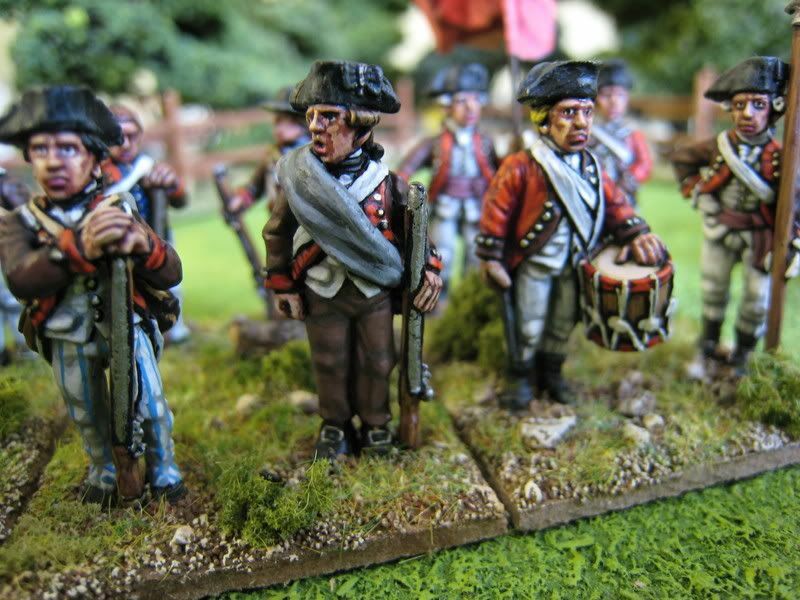 These Perry figures show the regiment as it might have looked in campaign dress from 1777/78 onwards. 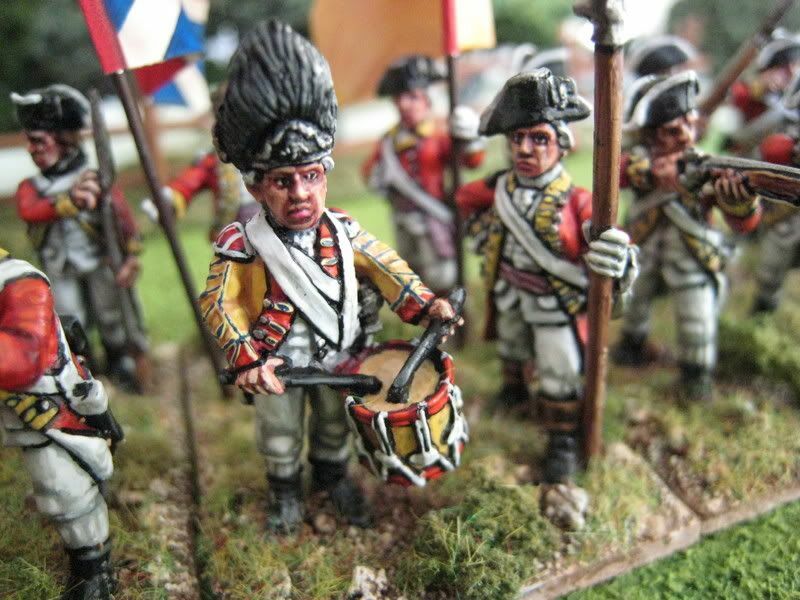 The unit's unique emblem is clear - the Prince of Wales' feathers in the soldiers' slouch hats, which makes this unit very distinctive on the tabletop. I have repeated the feathers motif on the back-flap of the soldiers' knapsacks (no one knows for sure what decoration these flaps had, but this seemed one possible option). Painted July/August 2006. 18 figures. Flags by GMB.